The Tele2 Lithuania brand belongs to a Swedish telecommunications company and has the best GSM coverage in the country together with the market leader Telia. The operator provides prepaid services under the brand called Pildyk. 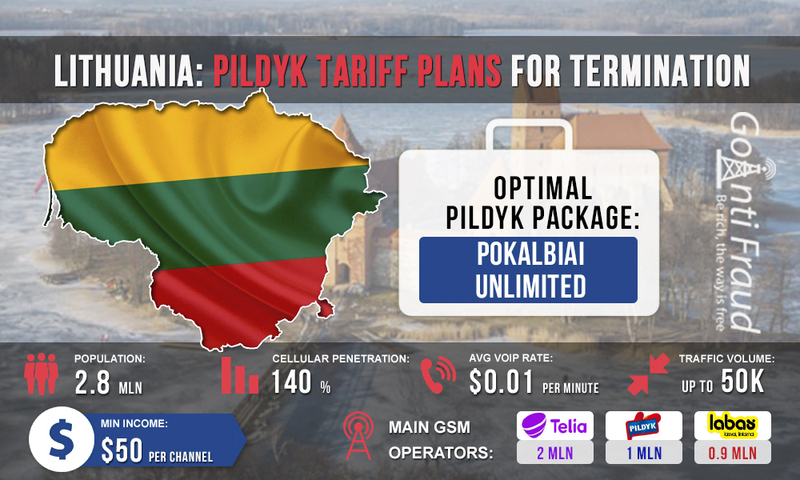 Pildyk is the most popular network in the prepaid services sector in Lithuania. The terminators can successfully use Pildyk SIM cards to earn money on termination. Unlimited. Cost - $4.8 a month, unlimited calls and SMS. 200 min + 2 GB. Cost - $5 a month, 200 minutes for calls + Internet traffic (2 gigabytes). 300 min + 3 GB. Cost - $7.3 a month, 300 minutes for calls + Internet traffic (3 gigabytes). Unlimited + 6 GB Cost - $9.5 month, unlimited calls + Internet traffic (6 gigabytes). For successful work in the traffic termination business, we recommend using the POKALBIAI UNLIMITED plan for prepaid subscribers. With this plan, a minute of call will cost you $0.005 (with the equipment operating for 15 hours a day). With low voip rates lithuania, your minimum earnings on traffic landing will constitute $70 (from each port of your VoIP GSM gateway).